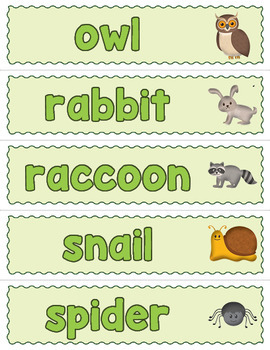 Decorate a wall of your science center or another part of your classroom with these colorful forest animals word wall slips. 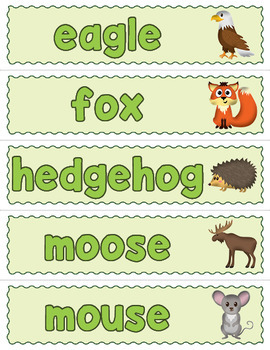 They would make a great addition to the classroom while studying a unit on biomes or ecology. 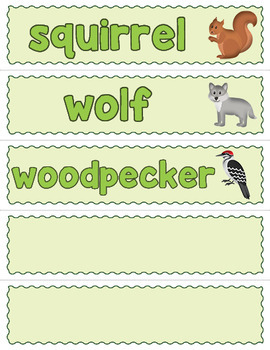 Each slip has an illustration of one of our woodland friends along with their name. They print five to a page. We recommend you laminate the slips for a durable resource you can reuse from one year to the next. 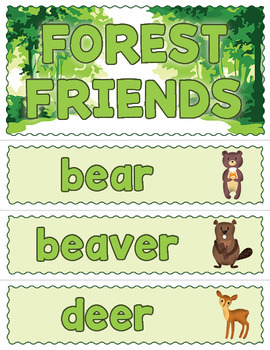 Along with the header that reads "Forest Friends", the words included are: bear, beaver, deer, eagle, fox, hedgehog, moose, mouse, owl, rabbit, raccoon, snail, spider, squirrel, wolf, woodpecker.